Mark Anderson, Furniture Conservator at the WInterthur/ University of Delaware Program in Art Conservation, is fixing up a copy press for their Book Conservation Lab. 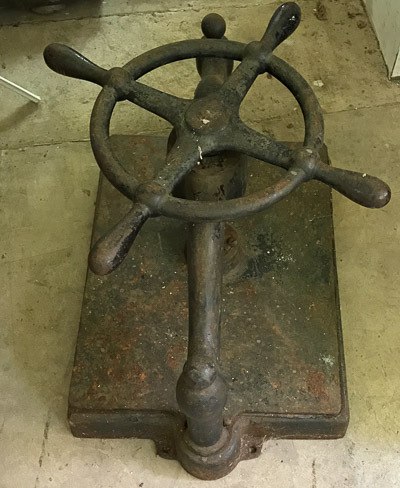 At first glance, it is a large but typical press, though with a nice hand-wheel with spokes extending beyond the rim, useful for extra leverage or pretending to be a captain steering a ship. Copy press usually have a steep thread pitch, which is great to move up and down rapidly, but they generate a lot of friction when tightening, therefore can’t generate as much pressure as a real book press. This is compounded by a common tendency of not attaching them to the bench. 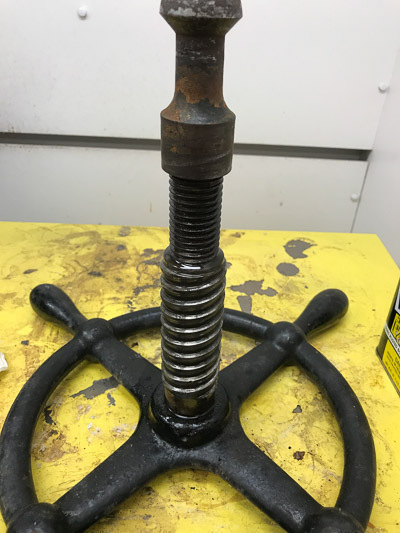 There is a reason almost all presses — like the one below — have four holes cast into the base, in order to screw into the bench! I guess that by having to hold a press with one hand, and tighten it with the other, the total compressional force is reduced by 25% or more. Once Mark took apart the press to clean it, he noticed an unusual aspect: the central screw had two different screw pitches and diameters on it. Apparently the finer thread is internally threaded into the larger one, though it is currently frozen. Two different thread pitches and diameters. Photo: Mark Anderson. 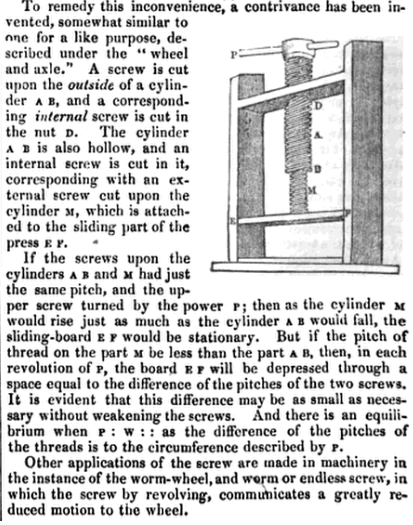 A similar style of screw is mentioned in the 1843 Practical Mechanic and Engineer’s Magazine. There may be earlier examples. Even today, external threads are sometimes referred to as male, and internal threads as female. In a surprisingly contemporary note, the writer in 1843 recommends that this coarse language should be abolished. Source: The Practical Mechanic and Engineer’s Magazine, Volume 2, p. 204. Although Mark’s example is inoperable at the moment, presumably the larger external coarse thread raises and lowers the platen quickly, and at the same time the internal thread moves more slowly, due to the finer pitch. But when the press firmly tightened, the smaller internal thread kicks in to apply more pressure. Fast operation and lots of pressure would be ideal for a copy or book press. For this to work, the finer thread needs to be affixed to the platen, as in the image from The Practical Mechanic and Engineer’s Magazine. In the press Mark is working on, it looks like it spins in the top of the platen, like most copy presses. An alternative explanation might be that the finer threads were left over from a different project, or cut wrong? But if this mechanism works as advertised, why wasn’t this a more popular mechanism for copy and book presses? Hopefully he can get the screw unfrozen and we can find out. 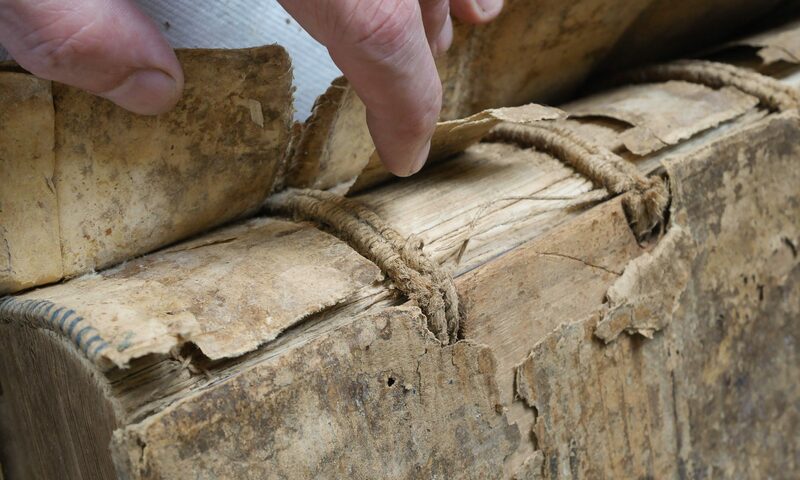 Next PostNext What is a Conservation Binding?